Texas and (almost) bust – Live MoHo! We drove from Carlsbad NM to Fort Stockton Texas today. There aren’t many ways to get there and the only route even close to direct is Highway 285. Little did we know that the stretch between Carlsbad and the Texas border was almost apocalyptically bad. That stretch is STRAIGHT UP THE WORST ROAD WE HAVE DRIVEN SO FAR. Its truly awful. Like something out of Mad Max awful. I would have happily driven an extra hour to avoid that stretch of HWY 285, had I known how bad it is. Anyway, it is oil country. 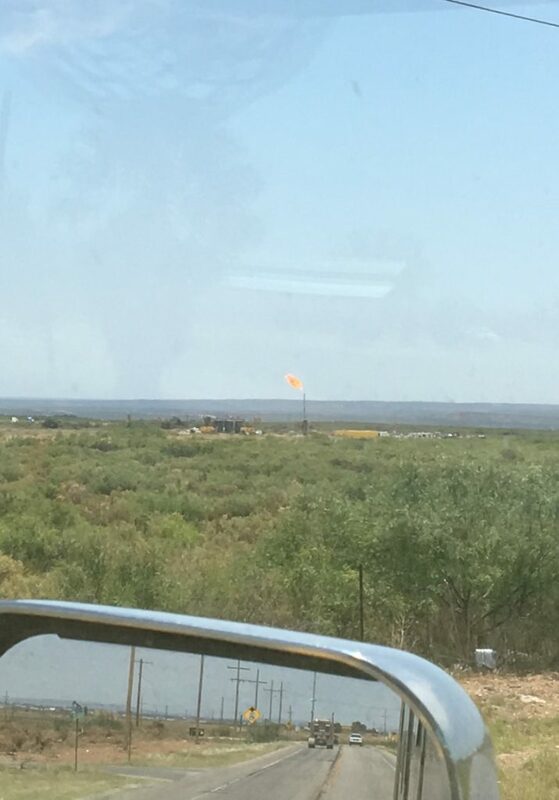 Derricks and pumps are everywhere along with gas flare towers. At night they light up the landscape. Its sad to see natural gas being so useless that its just burned off. Someday, I suspect we’ll wish we saved some of that natural gas. Because HWY 85 is the primary road servicing New Mexico oil country 3/4 of the vehicles on Highway 285 are large, fully-loaded tanker trucks that absolutely crush the pavement. 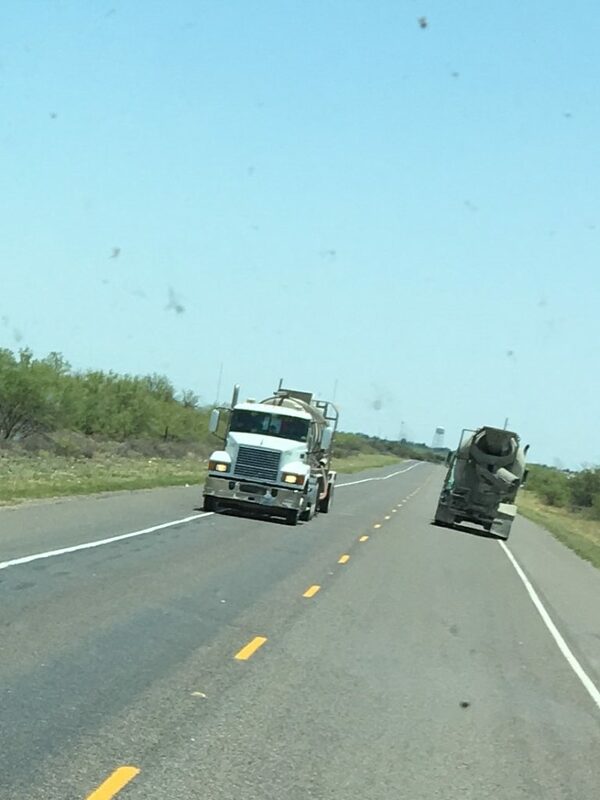 I have never seen a road where big rigs outnumber cars 4 to 1. And at least 2/3 of the “cars” are oil field trucks. That non-stop pounding from heavy truck after heavy truck, all following in a single lane turns NM 285 into rubble. The State, perhaps not wanting to cause delays, has resisted all temptation to fix the road damage. There were a few – maybe 3 – massive potholes that had been patched by an employee who I can only assume was new to the NM road crews and didn’t know this stretch of road is off limits to repairs! I have driven many dirt roads smoother than this. Hell, I’ve driven up dry creekbeds smoother than this. And it just never lets up. 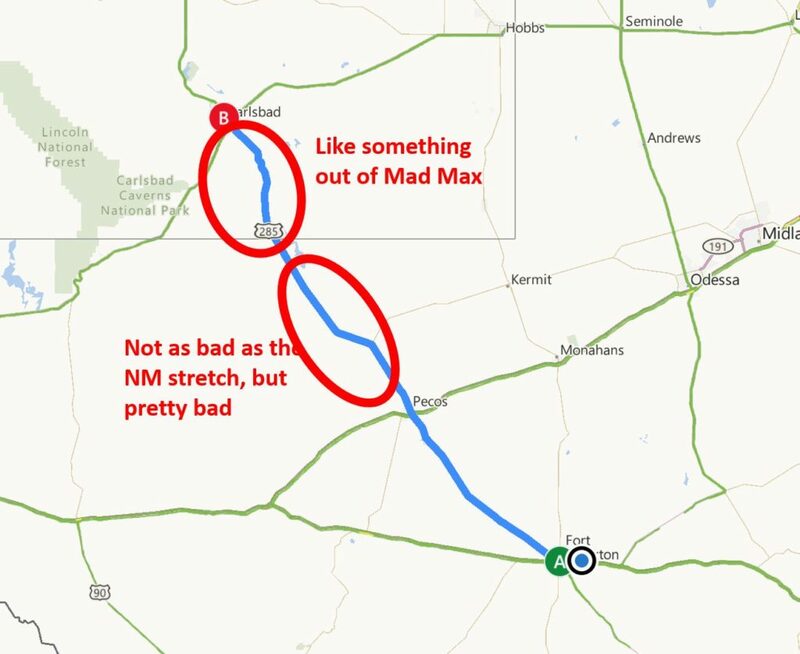 NM 85 down to Texas is like one giant pothole that can’t be avoided. Tiny shoulder on the right. Lines of semi trucks on the left. For nearly an hour we were shaken like we have never been shaken before. I’m pretty sure that many things on our MoHo must have broken and if they didn’t, my hat is off the the fine folks at Fleetwood. Adding to the fun are more “road gators” (exploded big rig tires) than I have ever seen in one place in my life. Road gator is the name for the rind of an exploded retread tire. Although in the case of HWY 285, there were some basically fully intact tires laying in the roadway. Hitting a road gator at speed is bad in a car but it can be devastating in a MoHo. The tread bounces underneath, ripping anything and everything it touches loose. Seeing so many was just crazy! The road is so bad, many people drive halfway in the shoulder so they can avoid the crushed pavement in the tire ruts. This guy was drifting to the right to avoid a really bad stretch just in front of him. I have not seen driving like this anywhere else. 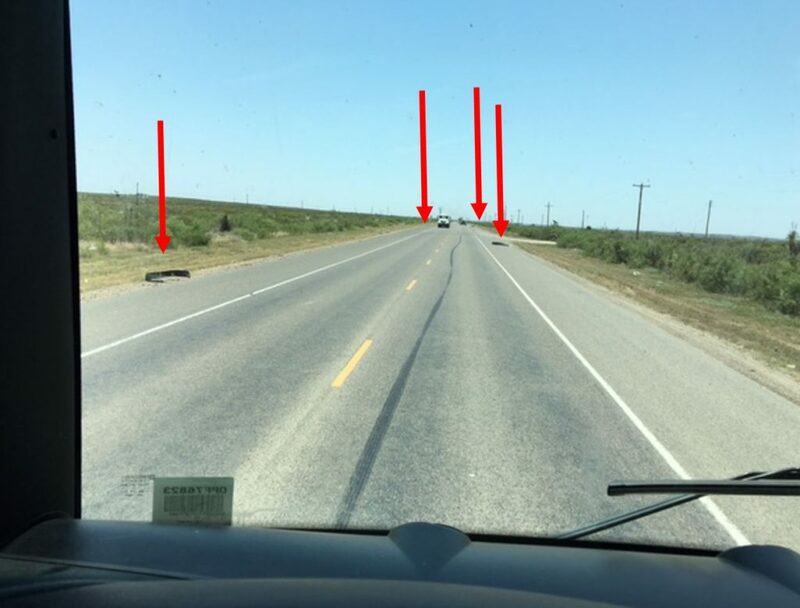 The Texas border is unmarked, but it is completely obvious because the road goes from one-step-above-bomb-damage to just really-busy-with-big-trucks. Good on Texas that they take the road more seriously. Still, it doesn’t turn into what most of us would consider a normal highway until Pecos. 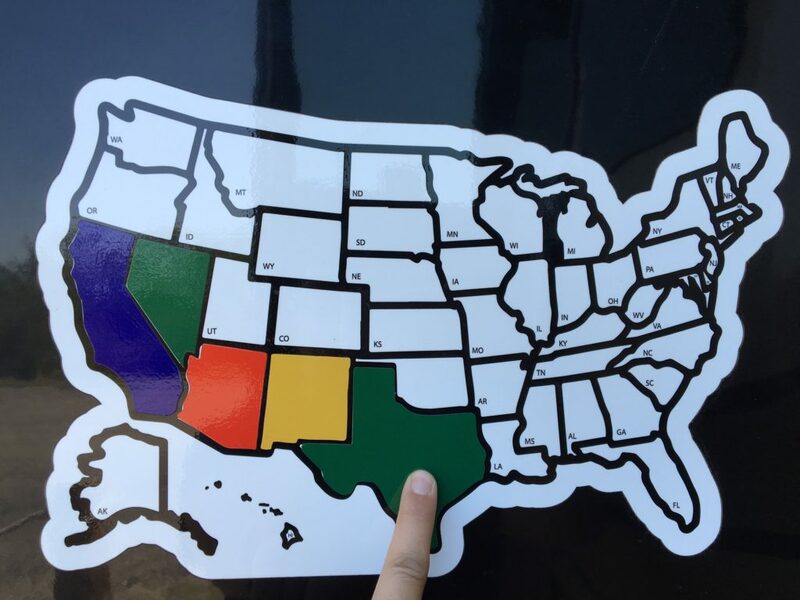 Adding Texas to the map! Gusty winds and 95 degree temps, flaring gas torches, horrible pavement, truck-after-truck-after-truck, industrial equipment everywhere? Yep. Mad Max. Today was an exhausting drive for everyone. Even the birds were fed up with the drive. I have not been so glad to pull into an RV park at the end of the day as I was today. Plus, the Fort Stockton RV Park has an on-site restaurant with the somewhat modestly self-proclaimed “third best chicken-fried steak in Texas” and BBQ boneless pork ribs that come from a local butcher. So naturally we need to go over to test the claims!